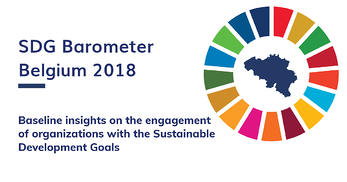 This first edition of the SDG Barometer in Belgium presents the current state of engagement, progress made so far, challenges, and the communication on the SDGs of Belgian organizations. What is the status of the SDG in Belgian organization? What are the main challenges for organizations? What are best practices when working with the SDGs? The SDG Barometer invitates public and private organizations to keep working on the SDGs and explore new practices and approaches. This research project was developed by Antwerp Management School and Antwerp University under the umbrella of the Antwerp Partnership for Sustainability together with Louvain School of Management. The project is supported by the Federal Institute of Sustainable Development and ING Belgium and further developed in partnership with The Shift, Cifal Flanders, VBO/FEB, UWE, VOKA, Essencia, Agoria, Febelfin and Fevia. We hope this report challenges and invites you to continue your journey and also go both fast and far!